I've found my software as cracked download on Internet, what to do? So, after 6 months of hard work finally released my application. Today I found the first web site where people download it cracked, and I was wondering if any of you fellow programmers know how to react to such stuff? Is there anything the software author can do to get the cracked version offline, or I'm just boned and shouldn't create anymore software, but just work on client's projects? What's your advice? Anybody with experience in that? post discussion: As I see how much interest this question generated I'd say even if not purely programming topic the community needed to say what they think. And I'd say this page became a very good read for any programmer interested in the topic. This question exists because it has historical significance, but it is not considered a good, on-topic question for this site, so please do not use it as evidence that you can ask similar questions here. This question and its answers are frozen and cannot be changed. More info: help center. Ok, I've been selling software online for almost 10 years. I have had several products marketed to both individuals and businesses. I am always shocked when I see developers are happy that someone thought their software was worth stealing. I mean, didn't you already know that? Why else would you spend time creating it if you didn't think it was worth anything? I'd wager you would not say, "Wow, I had some great stuff and feel honored someone went to all the trouble of taking it." if someone broke into your house and stole your property. Stealing is stealing no matter if it is a Porsche 911 turbo, music, software or a pack of gum. There is also another popular myth that pirated versions do not impact sales. I have done a few different experiments myself and also have friends in the industry that have seen significant revenue impacts due to piracy. In fact, I had one product that I could always tell when it was keygen'd because sales would immediately dive as much as 70%. I was using partial key verification, and when I updated the verification to make the bogus codes stop working sales immediately went back to normal. I assume you would call thousands of dollars a month a significant impact on sales? In one experiment I used the partial key verification to redirect customers who entered a pirated key to a special web page that explained they were stealing. Guess what? Over 50% of people who went to that page bought the software. That almost brought sales back to pre-keygen levels. Those people would have stolen the software if the code would have worked for them. This is a product with a fully functional 30 day trial, so they had already fully tested the software. Also, the product was under $20 USD, so it wasn't an expensive one. Other people I know have tried the redirect bogus codes to a web page technique with similar (and sometimes significantly better) results. I do agree that some people will never buy your software, and you have to balance protecting unauthorized use and inconveniencing honest customers. But don't be fooled into thinking piracy isn't a big problem and not worth investing a reasonable amount of effort to prevent. People aren't as honest as most of us would like to think. First I want to say, as I stated in my comment below, I am not going to get into an argument or debate about this--especially one based on semantics. I have debated this for years in person, at conferences, and in private forums. I've heard all the arguments before. Now I will try to answer some of the constructive questions. I tried my own experiment on two different products. One was an Outlook add-in to manage various hidden security settings. It was purchased by both individuals and companies. The numbers above are for that product. I also did another experiment on a business targeted product that translated database schemas to various formats. This product had slightly less (around 10% less, so 40%) conversion from the page I redirected the bogus keys to. I also am aware of several business owners that did the same experiment and discussed the results with me in private. These were a wide range of products. Some had a vertical market and some were very horizontal. Their conversion rate on the bogus key page was between 20% and 70%. Even at the low end that's a significant amount of extra revenue. If someone thought your product was good enough to be worth their time to crack it, you must be doing something right. Remember that there are more honest people in the world than dishonest and you won't get the dishonest people to buy your product whatever you do. So concentrate on keeping your honest customers happy. Contact the site owner. They should remove the incriminated download. If they don't you'll have to sue them. 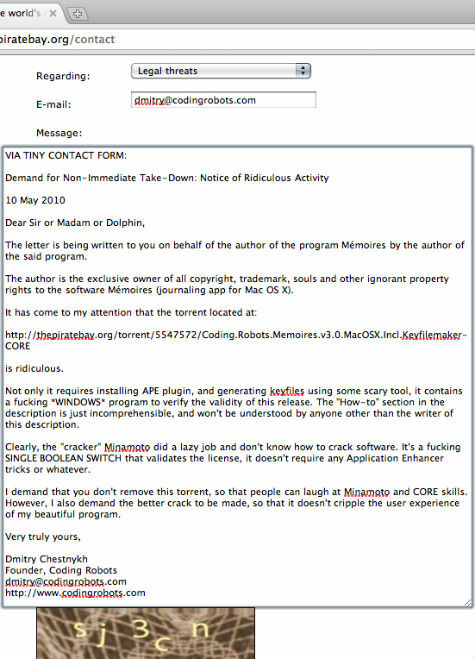 Anyway you should accept piracy as a natural part of your software lifecircle. Concentrate on making it as easy as possible to pay for the software. Think of Steam and iTunes. Dishonest people will always go to great lengths to avoid paying, but I think most people would gladly pay you if you make it easy enough. Keep the price low. If the price is low enough (say $5), it falls below the threshold of "practically free", and people will start thinking "$5 is nothing, I might as well pay". These two combined will prevent your honest customers from trying to get a hacked copy of your software. The most elegant solution I've seen was putting text along the lines on "cracks, warez, keygens, torrent files, free downloads etc. harm the publisher of this software" in small text at the bottom of all your web pages. It games the PageRank and (hopefully) causes users searching to cheat you to be sent to your site. I would keep updating the software. Sure there must be some bugs to fix and new features to add that your customers asked? When a user has a pirated version and is happy with it finds out that your current version has more features that might be an incentive for him to buy the latest version. Adding new features doesn't only make your existing customers happy, they also attract new customers. There's nothing you can do. Once the software is out there, it's out there. Sure, you could send all sorts of legal threats and takedown notices to the sites in question. And then those who acquired the software will post it to other sites. If the software hadn't already been made available for free, you could cram it full of DRM and copy protection and so on.... which just get cracked. Microsoft must have spent billions trying to prevent people from pirating Windows. I still know a good handful of people who run pirated versions of Windows 7 with no problems. You can't prevent people from pirating your software. What you can do is make people feel your software is worth paying for. Some developers have noticed some effect simply from posting a polite and personal message on torrent sites. On the torrent for your software, post a comment saying you're the developer of this software, and while you're glad to see that people like it, the money from software sales goes directly to you and your dog and no one else, and you can't afford to keep making software if you don't get paid. So please consider buying a license. Some companies try to combat piracy simply by treating their customers well. Make it something that people want to use. Sell it at a price that people are willing to pay. Provide extras for paying customers. Provide good support to people with a valid license. Some people are going to pirate your software. There's nothing you can do to prevent it. And it only takes one copy to appear on one warez site, before it spreads and becomes impossible to take down. On the other hand, those people who pirated it most likely weren't prepared to pay for it anyway. If they hadn't been able to pirate it, they simply wouldn't have used it. So in that sense, you haven't lost anything. Remember who your paying customers are. They are the ones you have to satisfy in order to run a successful business. The ones who don't pay aren't your customers, so they're a lot less important. You might find this blog post an interesting read too. I do not condone piracy. I am not saying you should love software pirates or treat them like your own children. I am merely saying that it is an unavoidable fact of life, and too many companies spend huge amounts on "piracy prevention" which doesn't prevent pirates from using their software, but does make the software less convenient to use for paying customers. Make you software work as SaaS in some cloud, so you'll be able to sell it for some traffic/features value, and will prevent it from cracking as it is. This is obvious a highly personal reaction. I don't expect anyone else to share it: Celebrate! Someone thinks your software's worth stealing! (c) people stealing your software means that you have solved the single biggest problem: obscurity. If no one knows of your program, no one's buying it. At least if someone's taken the trouble to crack your software, people know about your product. Another answer here offered several interesting ways of getting people to pay for your product. Change your business model. Selling something that can be duplicated at zero cost and no limitations, isn't a smart idea. Copyright and patents are only fake restrictions that can hardly work in the digital age. The good news is that if somebody bothered to crack your software that means it is popular/useful enough that people actually really want to use it... so you must be selling some! This reminds me of the autodesk/kinetix response, tho they claimed that the response was a complete accident, a byproduct of the crack itself. A cracked version of 3DSMax had a nasty side behavior - each time it opened a model file it corrupted the vertex coordinates just a little bit more- not enough to be noticable on any given run, but over time, a lot of damage could take place. The cost of the program might be thousands, but the cost in time and dollars to repair the damage dwarfed that. Just take what money you have, and move into another business. I gave up coding after the last bubble burst, and now own a couple of gas stations. My staff have shotguns to protect our product, it seems to work better than vague legal threats and keygens/drm do in the software world. It's not possible to make your software crack-proof. However, there are legal things you can do. You can send cease-and-desist letters to the owner of the website to remove the cracked version from their website. You can also sue. You can contact the ISP of the owner of the website to let them know of the illegal activity of that website owner. But in short--there's not really a whole lot you can do otherwise. About a decade ago I created some software for sale that was quickly hacked. Then I created a version with a rather complex anti-hacking scheme in it with a scary (but meaningless) warning that only popped up when partial hacking was attempted--the warning threatened to destroy all data on the C: drive. That seemed to work (it's never been hacked--though its now completely obsolete), but only introduced some ugly support nightmares. Contact Google with a DMCA notice, and have the page removed from the search index. This will make it difficult for people to find the pirated version. My friend wrote this article describing how he handles this situation. You never told us if the cracked version is from a demo version or not - but you should identify this directly from your builds. Is my practice to identify customers in the build's with a ID constant in several places. That way I can find the source of the leak just downloading the cracked one. Demo versions are prone to be cracked (but you should identify them too - one ID for tucows, other for major, etc). I don't have a easy way for that, except if you can consider online usage all the time. I believe that widespread software piracy usually means you're charging way too much for the basic version of your product, and that you'll ultimately be able to make much more money by drastically lowering the price of this entry edition - the market may even want this edition priced free. The key is then to properly segment the market to figure out who is able to pay what. As an example of this, look at Visual Studio vs Delphi/C++ Builder. The two used to be very competitive, with old Broderbund/Borland perhaps even ahead of Visual Studio at one time. And then Microsoft figured out they needed to give away a base version of Visual Studio that honestly has enough features for most of us to get by if we really needed to. The result? Delphi/C++ Builder completely lost the low end of the market where the students are that feed into the more-lucrative professional market. Now they're fading fast into irrelevance. It's simple. In the old days, if you couldn't afford or didn't want the cops to protect your well, or if -- in fact -- the cops didn't care, know what you'd do? If I were you, I'd increase prices by 5%. Then I'd release a fully-functional demo that says "Registered to [crack]" that accidentally cracks up and malfunctions. Publish this new version everywhere. Bitorrent, edonkey, usenet, all the pirate sites you find. Drown out the competition! Then direct cracked users to customer support and offer them a 5% discount if they register now and give the site where they downloaded the crack. Use the crack as a promo code to drive sells. I'd like to add, not paying for your software is like not paying your taxes. You may be getting ahead, but you are doing so by screwing everyone around you. Just accept it. 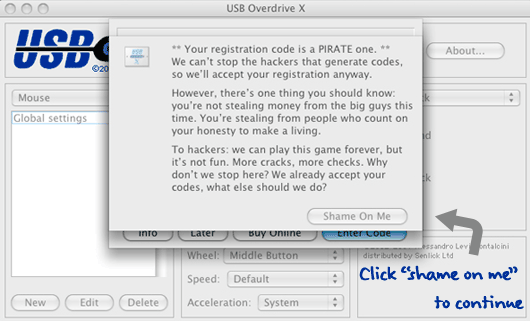 most people that are pirating your software probably wouldn't have bought it anyway. But that's not a reason to stop making software, pretty much every major piece of software gets cracked and pirated, but Adobe, major game studios, etc. are all still in business. I was so infuriated with some of comments and answers that justify software piracy that I had to write long rant: Is Software Piracy Stealing? . Consider piracy as a business expense that comes with the territory of having a product that can be sold to thousands at near zero product cost. We can't have it all our way. Just use basic protection to stop customers passing it around. Anything more is not worth the time and expense. Don't make your paying customers jump through licensing hoops. Often I'll pay for a product, get driven crazy by the licensing scheme and seek out a cracked version. Make trials not by period but by hours used. It's easy to get diverted and not have a chance to evaluate the software. Most people won't consider to ask for an extension. Consider if you've pirated music CDs, movies, software etc. yourself and rest in peace knowing it somewhat evens out. Always have different levels of your product. People don't want to pay big bucks for a product they only use 10% of. Make the product fantastic. Customers will eagerly await the latest version and not want to wait for a crack to appear. The users of poor products think, "I hate this product, it's full of bugs, but I haven't found anything better yet". That's inviting piracy. I find it disappointing how much people accept defeat nowadays and ignore ethical trespasses and things like fairness. I don't know for sure what I would do in your position, but at least one developer who found his cracked software available as a torrent emailed the host to complain -- not about the crack, but about the quality of the crack. It seems that the cracker didn't do a very good job and made the software less desirable. The developer was apparently horrified that his product, with his name, was going out to people and would ruin his product's good reputation, and demanded that if someone was going to crack it, that they needed to do a better job! Also consider price. I have no idea what your software is but there are multiple markets for every product. For example Photoshop has a normal version that is a little out of the cost range of anyone wanting to touchup their vacation shots. For this reason they make elements, it doesn't do as much but it does serve a market. If your software is expensive and of limited personal use try releasing a home version. A trial version, an ad supported version. Not the answer you're looking for? Browse other questions tagged software-distribution or ask your own question. How can I remove strings containing type names from Delphi executables and globally disable RTTI for a project? Licence and/or concurrent use enforcement mechanism for fairly open UNIX product? What service do you use to distribute software? What does the R means in software versions?